Competitive success thanks to A.I. Information overflow and data overkill forces us for faster decision. But the quality of our decisions does not get better! As a fact, more and more decisions are based on false information and made very unfortunate. 25% to 30% of all news published in online media (News Feeds, Twitter, News Articles, Facebook, etc..) are written by robot’s! … what is the truth? validating if the context and decisions thereafter will influence me or my business. The experience, the expertise and the personal networks of the domain experts are, among other things, the basis for successful work. 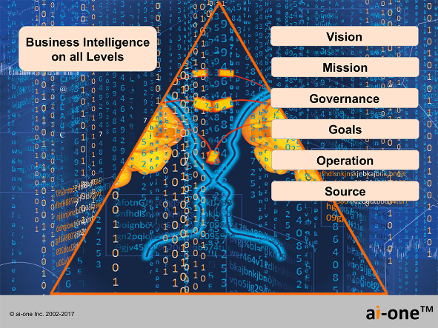 Nevertheless, there are various work steps, which could be taken over by a digital twin. 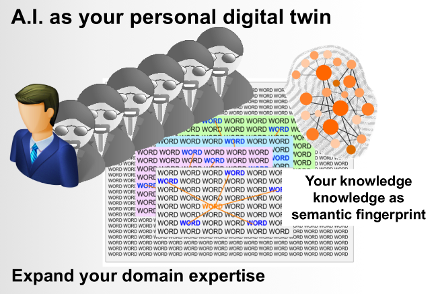 This would increase the efficiency and effectiveness of the domain experts. Intelligent agents, equipped with expert knowledge, take over various work steps and thus multiply the expertise and efficiency of the domain experts. Agents can be equipped with expert knowledge profiles from any field of expertise and thus extend directly the personal expertise of the experts. Automated data acquisition and data evaluation using intelligent agents, based on domain experts concepts and ideas.